» Cirque Musica Holiday: Pre-Sale Tickets on Sale Now! 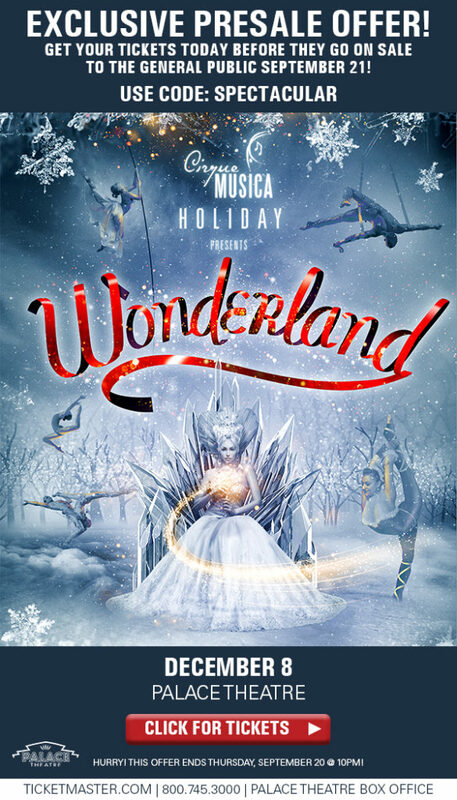 Home » Events » Cirque Musica Holiday: Pre-Sale Tickets on Sale Now! On, Saturday, December 8th, the Palace Theatre will host Cirque Musica presents Wonderland for one show only at 7:30 PM! Tickets go on sale to the public on Friday but you can buy the best seats NOW with the Presale Code: SPECTACULAR (valid until 9/21). Click HERE to order during the pre-sale. This entry was posted in Events, Kids and tagged events, Palace Theater. Bookmark the permalink.